Turkey — tender and moist. Crispy and golden on the platter. A twelve to fourteen pound bird that roasts in 2 and a half hours instead of 4. What creates this magic? 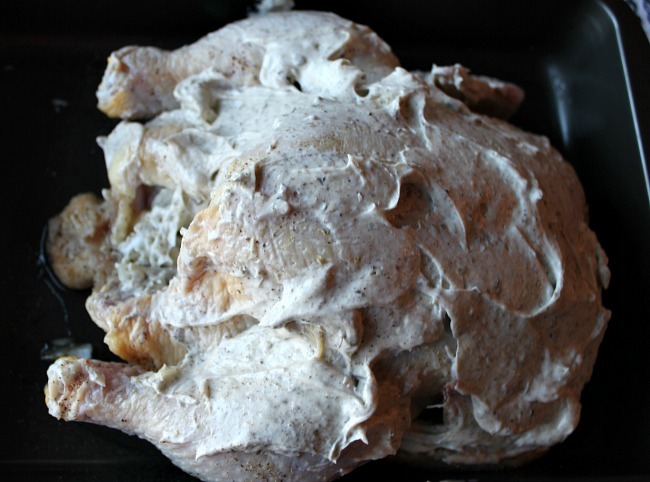 Mayonnaise makes the turkey moist and tender. And no, there is no mayo taste — just tender turkey. The bird turns out a beautiful deep golden color. The skin will be thin and on the crispy side. How to achieve a moist and tender roast turkey? Here’s secret # 1 — Begin with a thoroughly thawed turkey — no ice crystals. Thaw in the refrigerator according to package directions. Guidelines are 24 hours in the fridge for each 5 pounds of turkey weight. For a 12-14 pound turkey that’s about three nights so that means plan ahead! If you are like me — that planning ahead business doesn’t always happen! Backup to secret #1 — You can help the thawing process along by placing the still wrapped turkey, breast down, in a pot of cold water. Replace the water every thirty minutes. It will still take about 30 minutes per pound to thaw the turkey. That’s about six hours for a twelve pound turkey. A combination of a night or two in the fridge and 2 or 3 cold water baths will work. 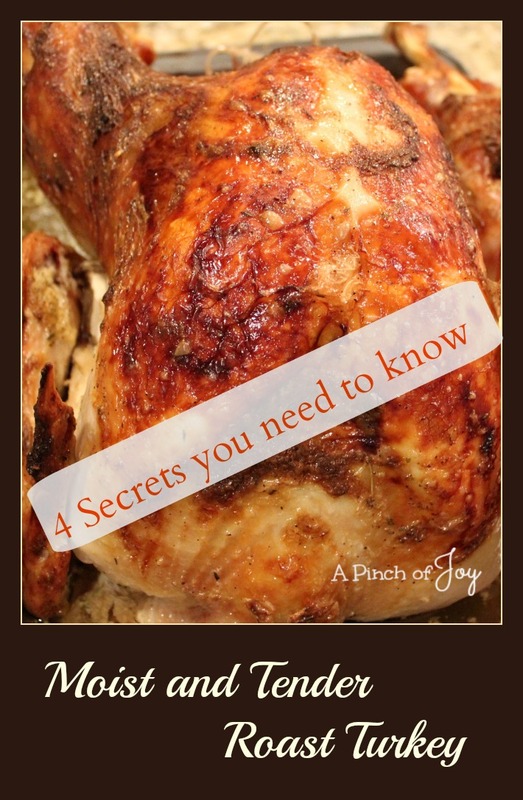 Secret #1 should really say — It takes a long time to thaw a frozen turkey!! Secret #3 — It also takes a long time to roast a turkey — usually. Normally it takes between 15 and 20 minutes per pound to roast a turkey at 350 degrees. That’s four hours for a twelve pound turkey. Secret # 3a – Raise the temperature or the bird quickly by placing it into an oven preheated to a temperature of 450 for the first thirty minutes. This helps reduce the cooking time by about half of the time remaining after the first half hour at high temp. Secret 3b — Keep the turkey juicy and tender by turning the temperature down to 350 after the initial thirty minutes. Letting the turkey set for 20 minutes after removing it from the oven will also make the turkey more moist. Secret 4 — Don’t guess. I’m preaching to me here. There are turkeys with the popup button that tells you when it is done. I like those — but not all turkeys have them. And they aren’t always accurate and you can end up with a dry, over cooked turkey. So spring for a thermometer. I resisted – didn’t want the clutter in the drawer, I could guess by sticking a fork in it (yeah, right), didn’t want to spend the money — blah, blah. I bought one with a gift card. OMG! So much easier than guessing. And we’ve had better, moister meat dishes consistently since it came in the house. 165 degrees in the breast. Turkey done!! Start checking after the first hour and check about every 30 minutes until close to 165 and then check every 15 minutes. More ideas for your holiday: Help! What Shall I Make for Holiday Dinner? A moist and tender version of the traditional holiday turkey with a tip to speed cooking time! Place turkey in roasting pan and liberally salt and pepper turkey inside and out. Cut about half of the butter into thin pats and slip under skin of turkey. Do the same with about a third of the onion. Place remaining butter in cavity of bird. Rough chop remaining onion and celery and place in cavity as well. Mix mayonnaise and seasoning. If turkey is larger or smaller than specified above, adjust amounts as needed. Spread generously over turkey breast and thighs. Place leftover spread in the cavity. Roast turkey in 450 degree oven for 30 minutes. Turn oven down to 350 degrees and continue to roast. The turkey is done when the temperature reaches 165. 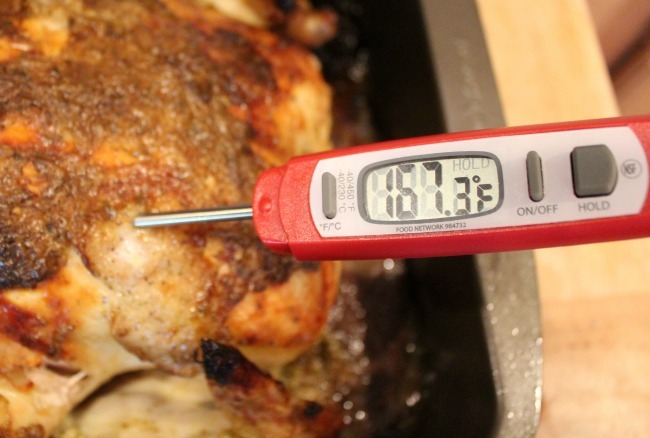 Check internal temperature in about 30 minutes and repeat at intervals until the thermometer reaches 165. The closer the thermometer to 165, the closer the intervals can be. Use drippings and juices for gravy, if desired. Serving size is about 4 ounces of meat, which is about the size of a deck of cards -- not one drumstick or one breast 🙂 Nutrition values do not include skin.